Access to the internet has never been easier. Your phone has wifi data while at home and wireless data while on the go. Your favorite café and store offer wifi to guests. Your work files can be accessed remotely from across the world. While we can access whatever we want from wherever we want, there needs to be restrictions set in place to regulate who and what is being accessed. Controls, whether it be parental, employer, or business, are becoming increasingly important. Dialogic works with communication service providers to create solutions to help better serve its customers, leveraging the DialogicONE platform. From easy to use applications for a parent wanting to keep an eye on their child’s internet usage, to full programs for businesses to keep track of employee accessibility. DialogicONE makes the daunting task of regulating internet access an easier and simpler application. The introduction of phones for kids stemmed from the idea of safety. Having a phone on them for an emergency situation, or the ability for a parent to get in contact with them at any time. Now, with smartphones dominating the market, kids have access to more than just phone calls and texts, they have access to the internet. 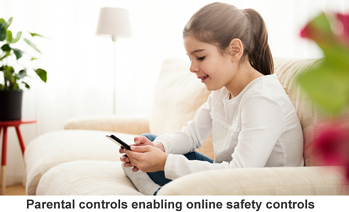 Parental controls allow parents to set restrictions of what their children have access to. This includes content, such as what types of websites and applications they can visit, as well as time constraints, deciding when they can access the internet. Parents can also keep track of how much access kids have to the internet. With the tap of an application on their own phone or tablet, parents can supervise their children’s internet access. They can easily add more internet time for chores done or a completed assignment. And on the flip side, they can limit usage and time for misbehaving, or before a project due date. While the settings can be managed from the kids’ phones, that can be tedious and time consuming to makes changes or updates. DialogicONE can consolidate the control settings for multiple phones and devices into one administrator app. The administrator, or parent, can make changes in real time to the kids’ access settings. Allow your kids to get the most out of their technology while resting assured they’re safe with age appropriate content. Notifications can be provided to parents when kids attempt to utilize internet outside the agreed schedules or access certain content – all towards having a safe environment for all. With internet now a standard in most work environments, employers need to be sure employees are keeping on track, and using the internet appropriately. Certain sites or content should be banned either all together, while other sites may only need to be banned during work hours. As Michael Scott from The Office put it “When I discovered YouTube, I didn’t work for five days.” For companies that provide wifi rather than a cable internet solution, they need to create access regulations. Are employees allowed to sign on to the wifi with their personal smart phones? While on the wifi, are they able to access any site they want? Having guidelines and rules helps to ensure all employees understand expectations and appropriate internet use. For companies with guests coming and going, it’s also important to think about a separate wifi connection, and possible password, for those visiting. Rather than standard rules for all employees, certain departments may want to set specific allowances and restrictions. Different roles require access to different online content. For example, the marketing team may be granted special access to social media apps. If they’re posting updates on Twitter and Facebook, they need to access these sites to perform their duties. Another type of access to take into consideration is remote access. Can employees get their work files from a home computer? While putting in a few extra hours from home on the evenings and weekends may make employers happy, they need to also consider the safety risk with remote file accessing. Between remote access and on-campus access, all of this information can be kept in employee logs. Employers can keep an eye on who is accessing what information, when they’re accessing it, and how often. With the latest focus on privacy and access to personal information, it is even more important to provide a working environment that is well orchestrated with those key aspects in mind. DialogicONE allows employers to oversee and analyze employees’ internet behaviour. This in turn helps them to make better, more informed decisions when it comes to usage and access for employees. With one consolidated system they can review behaviour, set restrictions, and make changes for the best interest of the company. It’s become common nowadays to find free internet access at most cafes. Between people working remotely, students, and free-lancers, there’s always those looking to find a nice spot to have a cup of coffee and do some work. Someone sitting at a café to work may stay a little longer and order more food, they may even snap a picture while they’re there, share it on social media, and tag the business in it. While the idea of free internet for everyone may seem ideal, there’s a lot to consider. First and foremost, businesses need to ensure they’re safe. Setting up a separate wifi for customers, as opposed to the business running on the same network, is crucial. Separate networks help protect against hackers and potential data breaches. With a separate network, businesses can also choose a less expensive, slower bandwidth for customers. There’s a fine line between good internet, and impossible to use because it’s so slow internet, in order to keep customers happy and coming back, be sure not to choose that latter! Businesses should also consider how customers will have access to the wifi and how long they can stay connected within a session. A password can be printed on a customer’s receipt, a password can be displayed, the customer may need to ask the barista, or, the internet can be open to anyone in the vicinity. Customers may be limited to an hour, or two, of free browsing before they’re disconnected. While there are pros and cons to each method, it comes down to how the business prefers to operate. DialogicONE can create applications that allows businesses to manage their networks in one simple platform. It can give businesses an understanding of who is using their services, and this information can be used to help shape future business decisions. With access to the internet available everywhere we go, it’s important that those in charge take the time and effort to understand the implications. By setting controls for kids, employees, and customers, they can ensure a safe environment, and appropriate use of internet resources. Dialogic works with Communication Service Providers to give consumers consolidated solutions. Dialogic is focused on helping service providers bridge silos, break into new applications and integrate platforms efficiently with our DialogicONE suite of solutions. We are experts in telecom with over 30 years of experience as well as architects of next generation applications and services for the service providers globally. We have solutions to address the roadblocks service providers face, and a proven track record working with them to leverage the past and move aggressively into the future.